In the midst of a conservation area are, from left, Bill Shininger, Chairman, Fulton County Soil and Water Conservation District, Jackie Savage, a Fulton County SWCD technician and Delta resident Dr. Robert Bay, a retired veterinarian. They are keeping company with a recently planted Swamp Oak as part of Bay’s Oak Savanna in Delta. DELTA – Residents of Delta need to go no further to see an Oak Savanna than to ask well known resident, Dr. Robert Bay. 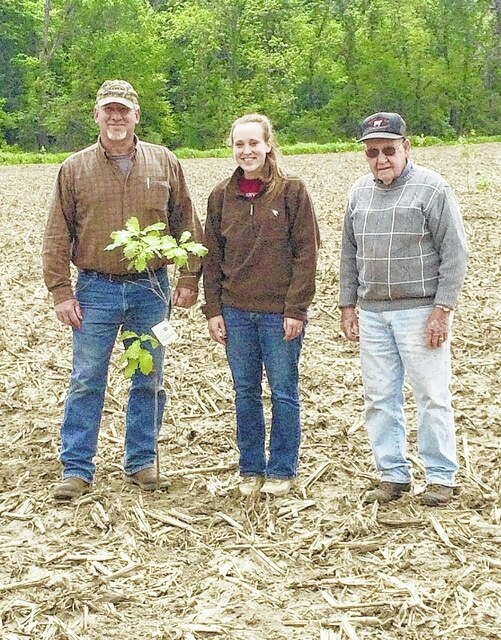 Dr. Bay, a recently retired veterinarian, worked with the Fulton County Soil and Water Conservation District (SWCD) to have a 3.8-acre Oak Savanna planted. His property is located on the corner of State Highway 2 and Wilson Street in Delta. This land, which still held attractive soils conducive to growing crops, was landlocked. Located inside the village limits, it is difficult to bring in large farm machinery to plant and harvest crops. “Although I’ve been able to find farmers willing to farm the land thus far, it was soon going to become impossible to continue to get the large machinery back into this area in the future,” said Dr. Bay. So what is an Oak Savanna? Oak Savannas are rare and unique ecosystems where dry environmental conditions result in sparse tree growth. Ample sunlight stimulates a diversity of herbaceous plants that are adapted to these fragile sandy-loamy soils. An Oak Savanna is one of the structures which can be developed on agricultural lands as a Conservation Reserve Enhancement Program (CREP). The region spans from the western portion of Lucas County, stretching in to portions of Fulton and Henry counties at the south end. To the north it extends almost to the Ohio-Michigan line. It is a band of sandy soil that is approximately 22 miles long and varies from three to five miles in width. Pete Carr, District Technician III with the SWCD noted that 48 landowners and 348.3 acres of Oak Savanna have been planted to date in Fulton County. Typical trees that are planted in this program are Pin Oak, Swamp White Oak, Red Oak, White Oak, Bur Oak and Black Oak. Grasses planted include Canada Wildrye, Big Bluestem, Little Bluestem, Indiangrass and Switchgrass. Wildflowers include, Partridge Pea, Purple Coneflower, Black-Eyed Susan, Perennial Lupine, Ohio Spiderwort, Greyheaded Coneflower, Autumn Sneezeweed, Coreopsis, New England Aster and Swamp Milkweed. Dr. Bay’s Oak Savanna was planted with a diversity of native grasses, forbs and trees as the location of this Savanna contains Shoals silt loam and Sloan silty clay loam which are soil types that are suitable for this ecosystem. Among the variety of flowers that were planted, the Wild Blue Lupin (Lupinus perennis) was planted, which is the only wildflower that the federally endangered Karner Blue Butterfly (Lycaeides Melissa Samuelis) will lay its eggs on, making the plant vital for its survival and reproduction. “I know that it’s going to take some time before the trees and vegetation on this property become mature, but I look forward to seeing it through,” notes Dr. Bay. “Because Oak Savannas through CREP (Conservation Reserve Enhancement Program) only exist in three Ohio counties, Fulton, Lucas and Henry, it is increasingly important to preserve and enhance these regions,” notes Jackie Savage, District Technician at SWCD. What types of land qualify for Oak Savannas? Fulton SWCD offers the Lake Erie CREP program for Oak Savanna’s in which there is no maximum size for this practice and the minimum area that can be enrolled is 0.1 acre. The area must be eligible cropland and have appropriate soils and topography for establishment of Oak Savanna. Savage recommends contacting the Fulton SWCD to speak with a technician if landowners would like to learn more about Oak Savannas or other CREP projects. The SWCD website is swcd.fultoncountyoh.com and their offices are located at 8770 State Highway 108, Suite B, Wauseon 43567. Their telephone number is 419-337-9217.